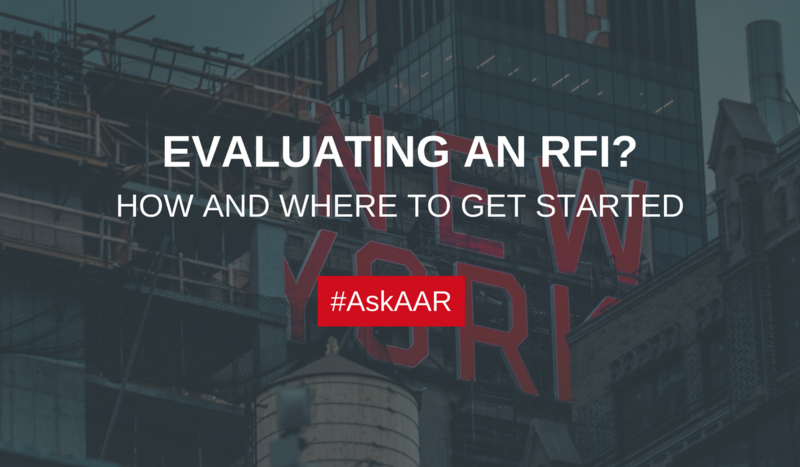 How Do You Evaluate An RFI? How do you evaluate an RFI? #AskAAR from AAR Partners on Vimeo. Over the years, I’ve been asked this question by many clients… now that I have all these RFIs sitting in front of me, what’s the best method for evaluating them? First – be sure to set aside a solid three to five days for reading. Some clients like to brief through all RFIs and then go back and read each one in-depth. Others like to read one of the vital questions asked in the questionnaire first to see if it’s worth their time to read the rest of the RFI. There are many options. It will help you to focus on past experience that matters to you and your brand’s immediate and/or future needs. And this will help you to project whether or not the agency’s experience and skills will be applicable to your brand’s growth. When reading each case study, keep in mind Problem, Insight, Solution, Results and Relevancy or as I like to say, just remember the acronym: PISRR. A little tongue in cheek but you won’t forget it. A clear case study highlights these key five components and they should easily pop out when reading the case study. If they don’t, then move on. If you’re working too hard to find the information you need to make a comprehensive decision then the proper experience most likely just isn’t there. Good luck with your agency search and if you need any guidance, think of AAR Partners! We’ve been managing agency review since 1980 and we’d be happy to help you too.